Insect artwork and insect macro photography. Butterflies, bees, dragonflies, beetles and whatever magnificent crawling, flying or swimming insect passes in front of my lens. They taste with their feet and have a suction tube for a mouth. Their eyes are made of 6,000 lenses and can see ultraviolet light. They drink from mud puddles and transform from caterpillars to fluttering adults. These fascinating magicians are butterflies! There are about 165,000 known species, found on every continent except Antarctica, and they come in a wide variety of colors and sizes. The largest species may reach 12 inches (30 centimeters) across, while the smallest may be only 0.12 inches (0.3 centimeters). Technically speaking, butterflies are types of moths. But there are some ways to tell them apart. Butterflies generally have long, smooth antennae that are rounded on the ends, while most moths have thick, feathery antennae. Moths also tend to have larger, fuzzier bodies than butterflies. Most moths fly at night, while most butterflies fly during the day. Because of when they're active, butterflies tend to be more colorful than moths, but that's not always the case. One of the most incredible things about butterflies is the way they change from crawling caterpillars into winged beauties. This process is called metamorphosis, and it has fascinated and perplexed people for centuries. In fact, scientists still aren't sure exactly how it works! What we do know is that when a caterpillar seals itself into a chrysalis, chemicals are released from its body that change and rearrange all the cells to create the butterfly's new shape, including its wings. So how does the caterpillar know when it's time to change? Its brain produces a chemical called "juvenile hormone." As long as the level of this hormone in its body is high, it keeps eating, growing, and shedding. But when the hormone level drops, then the caterpillar "knows" that it's time to move on to the next stage. Whether your lifetime is long or short lived... always reach to achieve your dreams. You may not be successful, or you maybe granted one wish, but you will have lived with purpose in being true to yourself... They taste with their feet and have a suction tube for a mouth. Their eyes are made of 6,000 lenses and can see ultraviolet light. They drink from mud puddles and transform from caterpillars to fluttering adults. These fascinating magicians are butterflies! There are about 165,000 known species, found on every continent except Antarctica, and they come in a wide variety of colors and sizes. The largest species may reach 12 inches (30 centimeters) across, while the smallest may be only 0.12 inches (0.3 centimeters). Technically speaking, butterflies are types of moths. But there are some ways to tell them apart. Butterflies generally have long, smooth antennae that are rounded on the ends, while most moths have thick, feathery antennae. Moths also tend to have larger, fuzzier bodies than butterflies. Most moths fly at night, while most butterflies fly during the day. Because of when they're active, butterflies tend to be more colorful than moths, but that's not always the case. One of the most incredible things about butterflies is the way they change from crawling caterpillars into winged beauties. 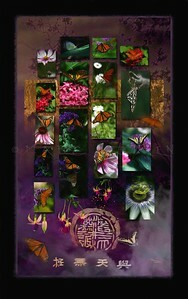 This process is called metamorphosis, and it has fascinated and perplexed people for centuries. In fact, scientists still aren't sure exactly how it works! What we do know is that when a caterpillar seals itself into a chrysalis, chemicals are released from its body that change and rearrange all the cells to create the butterfly's new shape, including its wings. So how does the caterpillar know when it's time to change? Its brain produces a chemical called "juvenile hormone." As long as the level of this hormone in its body is high, it keeps eating, growing, and shedding. But when the hormone level drops, then the caterpillar "knows" that it's time to move on to the next stage. EASTERN TIGER SWALLOWTAIL Papilio glaucus, the eastern tiger swallowtail, is a species of swallowtail butterfly native to eastern North America. It is one of the most familiar butterflies in the eastern United States, where it is common in many different habitats. The males are a bright yellow, while the females can exhibit two different color forms; yellow and black and black and blue. The darker form is more common in the southern states. The caterpillar is just as remarkable, it resembles a small snake with eyespots. 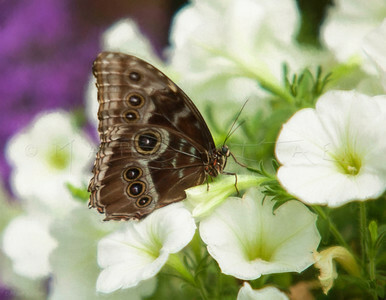 This butterfly particularly enjoys pink, purple, and red flowers, and is a wonderful visitor to any garden. 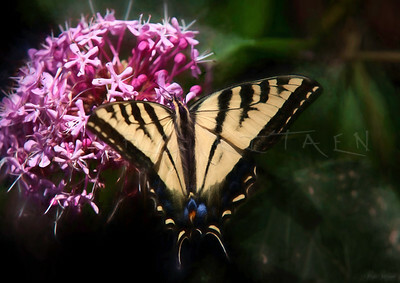 The eastern tiger swallowtail ranges from Alaska and the Hudsonian zone of Canada to the southern United States, east of the Rocky Mountains. An owl butterfly is a butterfly, in the genus Caligo, As their name implies, owl butterflies are characterized by their huge eyes resembling owl’s eyes. They are found in the rainforests and secondary forests of Mexico, Central, and South America. Commonly seen flying around dusk, these endangered butterflies, own an 8 inches wingspan but are only capable of flying short distances at a time. 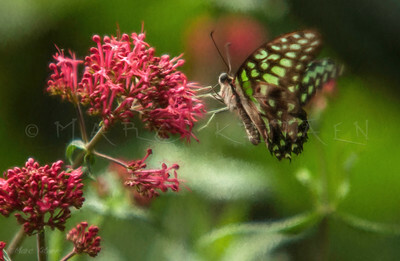 MALACHITE BUTTERFLY (Siproeta stelenes) The striking Malachite uses its incredible coloring, large size, and confident elegant flight to win over the hearts of any butterfly lover. Beginning as horned, prickly black caterpillars with red markings, the Malachite turns into a lime green chrysalis spotted with pink and eventually evolves into a stunning adult butterfly. The top side of the Malachite wing is a lively green, emphasized with black stripes, ovals, and rectangles in regular patterns. The underside of the wing experiences the same black stripes and rectangles, but highlighted with orange. Typically, the wingspread is between 8.5 and 10 cm (3.3 and 3.9 in). The malachite is found throughout Central and northern South America, where it is one of the most common butterfly species. 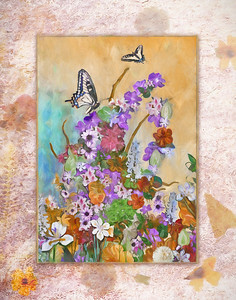 BUTTERFLY SPLASH is a mixed media photo collage project. They taste with their feet and have a suction tube for a mouth. Their eyes are made of 6,000 lenses and can see ultraviolet light. They drink from mud puddles and transform from caterpillars to fluttering adults. These fascinating magicians are butterflies! There are about 165,000 known species, found on every continent except Antarctica, and they come in a wide variety of colors and sizes. The largest species may reach 12 inches (30 centimeters) across, while the smallest may be only 0.12 inches (0.3 centimeters). Technically speaking, butterflies are types of moths. But there are some ways to tell them apart. Butterflies generally have long, smooth antennae that are rounded on the ends, while most moths have thick, feathery antennae. Moths also tend to have larger, fuzzier bodies than butterflies. Most moths fly at night, while most butterflies fly during the day. Because of when they're active, butterflies tend to be more colorful than moths, but that's not always the case. One of the most incredible things about butterflies is the way they change from crawling caterpillars into winged beauties. This process is called metamorphosis, and it has fascinated and perplexed people for centuries. In fact, scientists still aren't sure exactly how it works! What we do know is that when a caterpillar seals itself into a chrysalis, chemicals are released from its body that change and rearrange all the cells to create the butterfly's new shape, including its wings. So how does the caterpillar know when it's time to change? Its brain produces a chemical called "juvenile hormone." As long as the level of this hormone in its body is high, it keeps eating, growing, and shedding. But when the hormone level drops, then the caterpillar "knows" that it's time to move on to the next stage. Heliconius charithonia, the zebra longwing or zebra heliconian, is a species of butterfly belonging to the subfamily Heliconiinae of the Nymphalidae. The boldly striped black and white wing pattern is aposematic, warning off predators. When it is disturbed, the zebra longwing butterfly makes a creaking sound by wiggling its body. At night, large groups will roost together on tree limbs. They return to the same roost night after night. 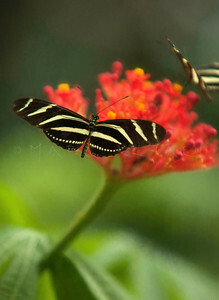 The zebra longwing butterfly can be found in the southern United States from Texas to Florida. It is also found in Central America and northern South America. 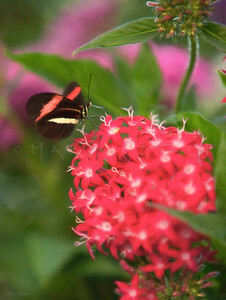 The zebra longwing butterfly (Heliconius charitonius) was designated the official state butterfly of Florida in 1996. The postman butterfly has large long wings with an orange stripe down each forewing. Postman butterflies (Heliconius erato) are slow-flying, laying small yellow eggs on the leaves of passion flower species. As caterpillars, leaves of Passiflora species. As adults, flower nectar, rotting fruit, and pollen. Postman butterflies are partial to Lantana flowers as well. This foul-tasting butterfly has little to fear from predators. As caterpillars, they feed on passion flower leaves, storing up toxic chemicals retained throughout their lifespan. 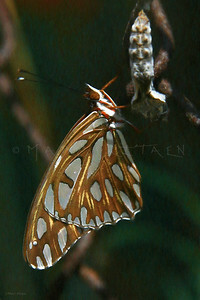 Males patrol during the day for females, and also mate with females as they emerge from the chrysalis. After mating, males place a repellant chemical on the female's abdomen to keep other males from mating with her. Eggs are laid singly on young tendrils and shoots, which the caterpillars eat. The postman butterfly, common postman, or simply postman is one of the heliconiine butterflies found from Mexico to northern South America. A MONARCH BUTTERFLY IS BORN The monarch butterfly or simply monarch is a milkweed butterfly in the family Nymphalidae. Other common names depending on region include milkweed, common tiger, wanderer, and black veined brown. Monarch butterflies go through four stages during one life cycle, and through four generations in one year. It’s a little confusing but keep reading and you will understand. The four stages of the monarch butterfly life cycle are the egg, the larvae (caterpillar), the pupa (chrysalis), and the adult butterfly. The four generations are actually four different butterflies going through these four stages during one year until it is time to start over again with stage one and generation one. 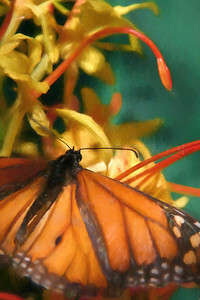 In February and March, the final generation of hibernating monarch butterflies comes out of hibernation to find a mate. They then migrate north and east in order to find a place to lay their eggs. 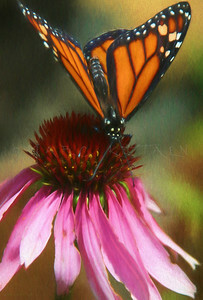 This starts stage one and generation one of the new year for the monarch butterfly. In March and April the eggs are laid on milkweed plants. They hatch into baby caterpillars, also called the larvae. It takes about four days for the eggs to hatch. Then the baby caterpillar doesn’t do much more than eat the milkweed in order to grow. After about two weeks, the caterpillar will be fully-grown and find a place to attach itself so that it can start the process of metamorphosis. It will attach itself to a stem or a leaf using silk and transform into a chrysalis. Although, from the outside, the 10 days of the chrysalis phase seems to be a time when nothing is happening, it is really a time of rapid change. 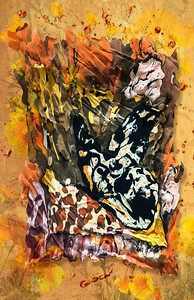 Within the chrysalis the old body parts of the caterpillar are undergoing a remarkable transformation, called metamorphosis, to become the beautiful parts that make up the butterfly that will emerge. The monarch butterfly will emerge from the pupa and fly away, feeding on flowers and just enjoying the short life it has left, which is only about two to six weeks. This first generation monarch butterfly will then die after laying eggs for generation number two. The second generation of monarch butterflies is born in May and June, and then the third generation will be born in July and August. These monarch butterflies will go through exactly the same four stage life cycle as the first generation did, dying two to six weeks after it becomes a beautiful monarch butterfly. Adult butterflies have large, often brightly coloured wings, and conspicuous, fluttering flight. The group comprises the large superfamily Papilionoidea, along with two smaller groups, the skippers (superfamily Hesperioidea) and the moth-butterflies (superfamily Hedyloidea). Butterfly fossils date to the Palaeocene, about 56 million years ago. Butterflies have the typical four-stage insect life cycle. 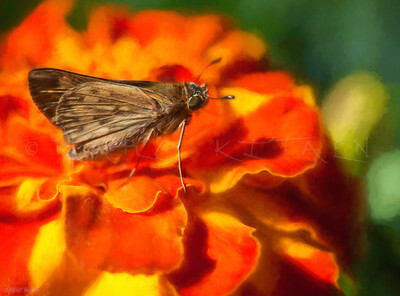 Winged adults lay eggs on the food plant on which their larvae, known as caterpillars, will feed. 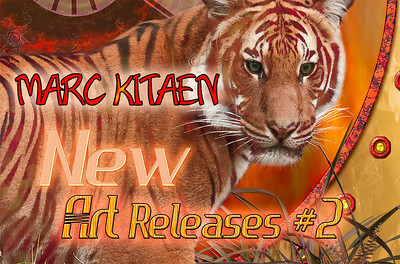 The caterpillars grow, sometimes very rapidly, and when fully developed, pupate in a chrysalis. When metamorphosis is complete, the pupal skin splits, the adult insect climbs out, and after its wings have expanded and dried, it flies off. Some butterflies, especially in the tropics, have several generations in a year, while others have a single generation, and a few in cold locations may take several years to pass through their whole life cycle. Butterflies are often polymorphic, and many species make use of camouflage, mimicry and aposematism to evade their predators. Some, like the monarch and the painted lady, migrate over long distances. Butterflies are distributed worldwide except Antarctica, totaling some 18,500 species. 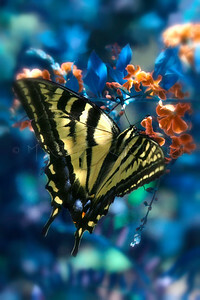 Butterfly adults are characterized by their four scale-covered wings. These scales give butterfly wings their colour: they are pigmented with melanins that give them blacks and browns, as well as uric acid derivatives and flavones that give them yellows, but many of the blues, greens, reds and iridescent colours are created by structural coloration produced by the micro-structures of the scales and hairs. 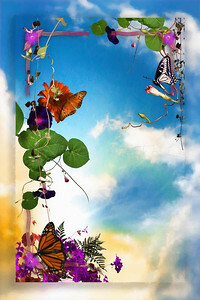 "Sensoria" is photo collage devoted to the wonders of butterflies, and is designed to guide you to each individual butterfly image, appreciating moments captured and the grounding calm it produces as a whole story. HONEY BEE OPIUM POPPY The honey bee (Apis mellifera) is responsible for approximately 80% of the pollination of fruits, nut, grains, and vegetables in the United States today. 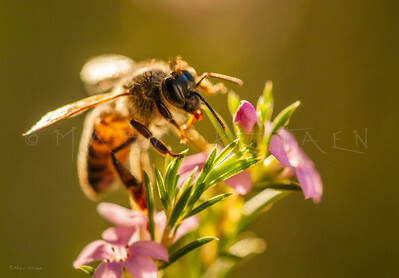 Honey bees are not native to North America; they were brought here by European settlers in the colonial days to pollinate their crops and for the products created or gathered by the honey bees-honey, propolis, royal jelly, pollen, and beeswax. But their contribution to mankind does not end there. More recently, research indicates that honey bee venom therapy may ultimately provide treatments for a variety of medical conditions in humans, including arthritis. 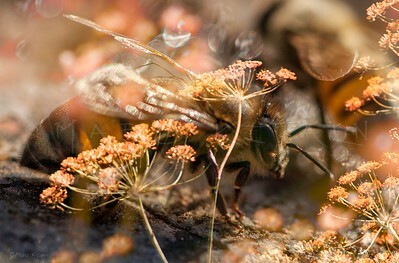 The greatest value of honey bees is in their service as pollinators which far outweigh their value as honey producers. The honey bee is well adapted for pollination. Each colony contains thousands of individuals which are available to forage for the food (pollen and nectar) that's required to rear their young. Like other bees, their sense of smell, eyes, mouthparts, and numerous branched body hairs are ideally suited for finding food sources, sipping nectar, and collecting and distributing pollen. 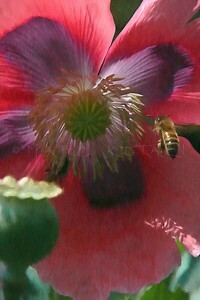 Honey bees visit a wide variety of flower types. In a single day, one bee makes 12 or more trips from the hive, visiting several thousand flowers. On each trip, it confines its visit to one plant species, collecting one kind of pollen. Honey bees have a complex communication system that enables the colony to find and collect food with maximum efficiency. These characteristics make honey bees a most valuable agent for cross-pollinating crops. HONEY BEE HOPPER The honey bee (Apis mellifera) is responsible for approximately 80% of the pollination of fruits, nut, grains, and vegetables in the United States today. Honey bees are not native to North America; they were brought here by European settlers in the colonial days to pollinate their crops and for the products created or gathered by the honey bees-honey, propolis, royal jelly, pollen, and beeswax. But their contribution to mankind does not end there. More recently, research indicates that honey bee venom therapy may ultimately provide treatments for a variety of medical conditions in humans, including arthritis. The greatest value of honey bees is in their service as pollinators which far outweigh their value as honey producers. 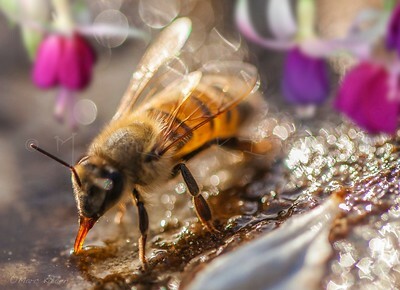 The honey bee is well adapted for pollination. Each colony contains thousands of individuals which are available to forage for the food (pollen and nectar) that's required to rear their young. Like other bees, their sense of smell, eyes, mouthparts, and numerous branched body hairs are ideally suited for finding food sources, sipping nectar, and collecting and distributing pollen. 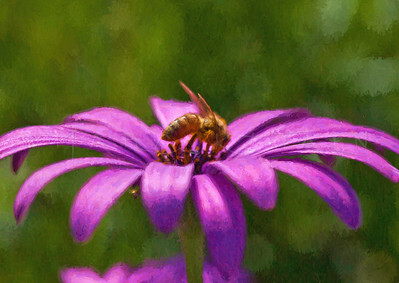 Honey bees visit a wide variety of flower types. In a single day, one bee makes 12 or more trips from the hive, visiting several thousand flowers. On each trip, it confines its visit to one plant species, collecting one kind of pollen. Honey bees have a complex communication system that enables the colony to find and collect food with maximum efficiency. These characteristics make honey bees a most valuable agent for cross-pollinating crops. 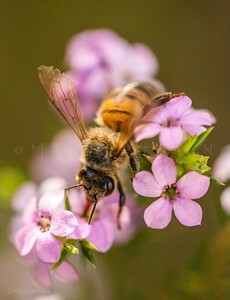 HONEY BEE FLOWER INSPECTOR PURPLE The honey bee (Apis mellifera) is responsible for approximately 80% of the pollination of fruits, nut, grains, and vegetables in the United States today. Honey bees are not native to North America; they were brought here by European settlers in the colonial days to pollinate their crops and for the products created or gathered by the honey bees-honey, propolis, royal jelly, pollen, and beeswax. But their contribution to mankind does not end there. More recently, research indicates that honey bee venom therapy may ultimately provide treatments for a variety of medical conditions in humans, including arthritis. The greatest value of honey bees is in their service as pollinators which far outweigh their value as honey producers. The honey bee is well adapted for pollination. Each colony contains thousands of individuals which are available to forage for the food (pollen and nectar) that's required to rear their young. 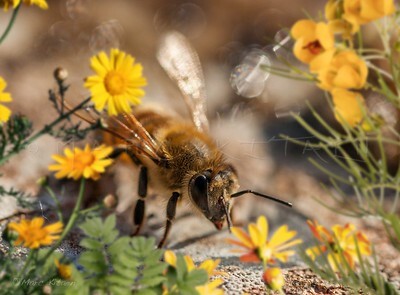 Like other bees, their sense of smell, eyes, mouthparts, and numerous branched body hairs are ideally suited for finding food sources, sipping nectar, and collecting and distributing pollen. 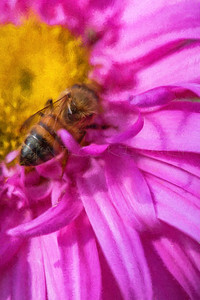 Honey bees visit a wide variety of flower types. In a single day, one bee makes 12 or more trips from the hive, visiting several thousand flowers. On each trip, it confines its visit to one plant species, collecting one kind of pollen. Honey bees have a complex communication system that enables the colony to find and collect food with maximum efficiency. These characteristics make honey bees a most valuable agent for cross-pollinating crops. 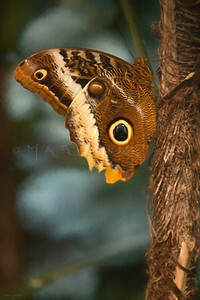 An owl butterfly is a butterfly, in the genus Caligo, As their name implies, owl butterflies are characterized by their huge eyes resembling owl’s eyes. They are found in the rainforests and secondary forests of Mexico, Central, and South America. Commonly seen flying around dusk, these endangered butterflies, own an 8 inches wingspan but are only capable of flying short distances at a time.